2019 is the year of minimalism for me. I have collated so much stuff over the past 18 months and it’s about time I started using them. I had a huge sort out after Christmas as my friend’s workplace were collecting beauty products for a women’s charity and I donated a huuuuuge bag full of stuff. However, I still have so many drawers stuffed with products. The rule was to not buy any beauty products unless I’d ran out of something. I have bought the odd bits and pieces but my former weekly hauls have turned into monthly necessity trips for a couple of essentials. It’s been insightful to actually use up the products I have and really see which ones work for me. If I’ve found that an item irritates, I’ve been keeping a box with those products in to give to my friends, who are incredibly lucky to have regular skin with no eczema and have no problem trying any new product! Because of this, I tend to gravitate to the same types of products (sensitive skin, fragrance free etc) so I have a strong feeling the item will work for me. 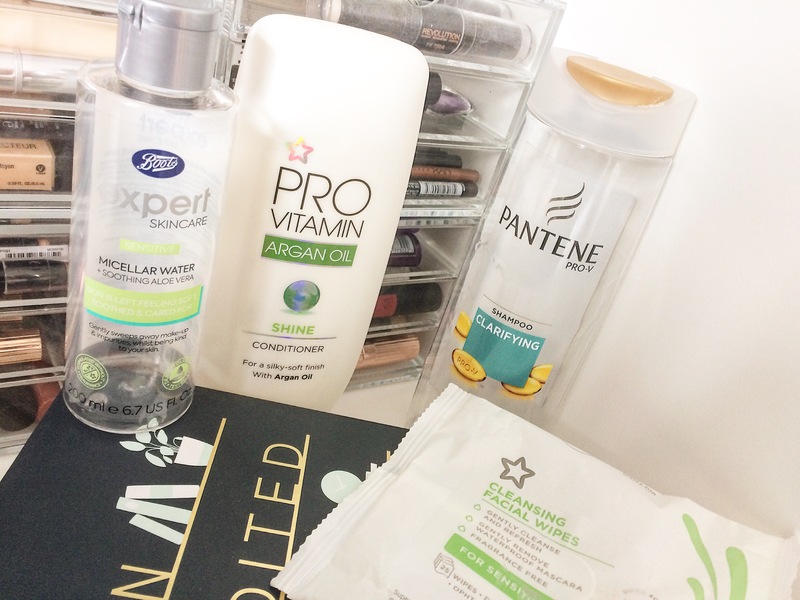 Boots Expert Sensitive Micellar Water: Micellar water is the skincare product I go through the most so I like to have a collection in. I found that I had to use a lot of this product to clean my skin, which sort of defeats the point of buying it. Compared to other micellar waters I’ve used, it’s not my favourite. Weird, considering it’s designed for sensitive skin. Superdrug Pro Vitamin Shine Conditioner with argan oil: I’ve been using this range for ages now and for some reason, I think it’s not working anymore. I’ve had a few half bottles open whilst I’ve been trying some new products so thought it was about time to finish them! Repurchase? Yes, but not for a while. Pantene Clarifying Shampoo: I’m not sure this is still available to buy anymore but it works wonders. It gets rid of all the greasy build-up from your scalp, which is a god-send. However, since I’ve gone cruelty-free, Pantene are not a brand I buy anymore. I have found another alternative and will be using this one for the time being. Superdrug Cleansing Facial Wipes for sensitive skin: I know, I know, face wipes are bad for your skin but sometimes you just need to use one. I only use them if I’ve been wearing heavy foundation as I find it takes the bulk of the product off before I go into my usual cleansing routine. Because I wear heavy make-up infrequently, I don’t mind using them on occasion as they don’t dry out my skin. Superdrug Body Spray in Seduce: Since going cruelty free, I’ve found it hardest to find budget deodrants and body sprays but was thrilled to find that all of Superdrug’s own brand products are cruelty-free, hooray! I like subtle smells, not floral or sweet, and this is perfect. Repurchase? Yes, when I’ve used my current ones up. 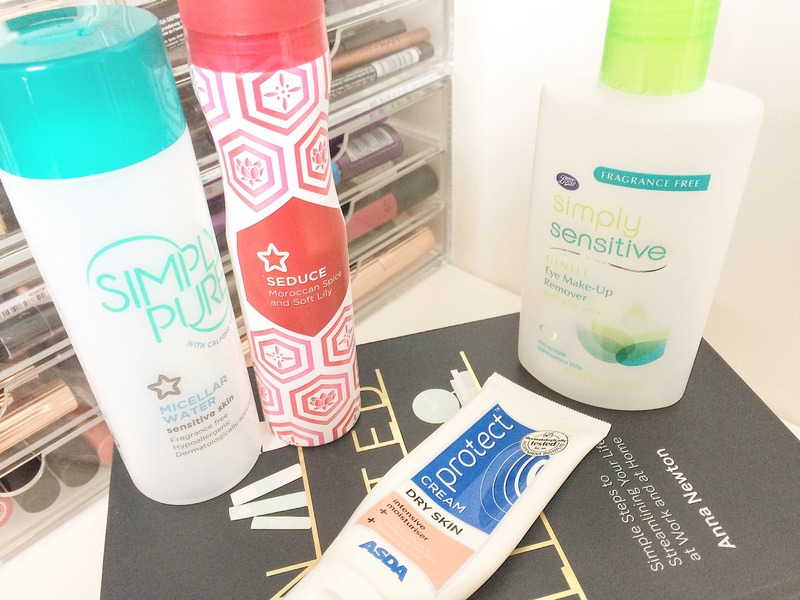 Boots Simply Sensitive Eye Make-up Remover: Although they don’t do this exact eye make-up remover anymore, they have rebranded their Simply Sensitive range to the Boots Expert Sensitive range. I imagine the new range is similar to the old one and I hope it is because it’s my favourite eye make-up remover! Luckily I stocked up before the rebrand so I have a while before I’ll need to rebuy. Repurchase? Yes, I’ll give it a try when I’m out of my current stock. Superdrug Simply Pure Micellar Water: This is my favourite skincare product by far, I just wish the bottles were bigger in volume! 150ml doesn’t last me very long at all, maximum of a month, so that is my only improvement for this micellar water. It doesn’t react with my skin and it clears off my make-up, which is exactly what I’m looking for in a micellar water! Asda Protect Cream Dry Skin Intensive Moisturiser: Unfortunately, this moisturiser was discontinued a couple of years ago but sensibly, when I saw it had gone to 17p a bottle, I bought about 50 of them and cleared all of my local Asdas. I really struggle with moisturisers for my eczema so this is a godsend. I don’t know what I’ll do when I get down to my last bottle though! Repurchase? I wish I could! Carex Pure and Free From Shower Gel: I have to be super careful when it comes to shower gel because of my eczema. They must be clear or creamy, for sensitive skin and fragrance free. This is one of my favourites but I’ve no idea where I bought it from, possibly Bodycare. You only need a small amount and it lathers up tonnes, meaning a bottle lasts for ages. Repurchase? Yes, if I can find it! 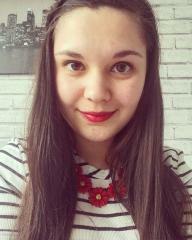 Revolution Fast Base Foundation Stick in F6: This is my new favourite foundation; I have it in a couple of shades because my face is the only part of me that tans during the summer. 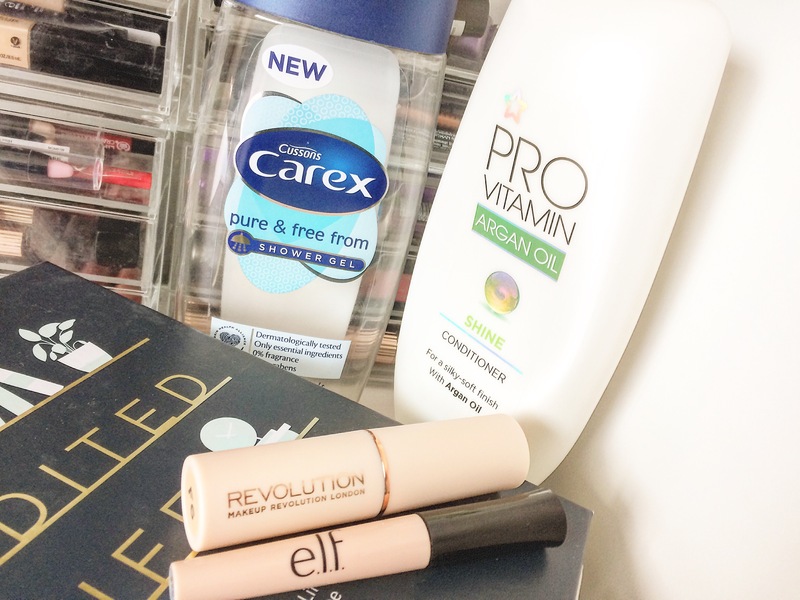 I have found that you need to have super smooth skin for this foundation to sit properly so I try to exfoliate and moisturise throroughly before using it. Repurchase? Yes, after I’ve used up the three sticks I have of it already! ELF Shadow Lock Eye Primer in Sheer: I find eye primer difficult to get along with because I am forever faithful to my Nyx one. I found this ELF primer to be light but not durable. If I’m only going to be wearing eyeshadow for a couple of hours, it’s perfect. Anything more and it starts to crease. Repurchase? Yes, as a back up. No7 Exreme Length Waterproof Mascara (mini, not pictured): I’ve got two of these from various No7 offers as part of a freebie box and also bought the full size version too. For some reason, the mini is nowhere near as good as the full size! You have to apply about six coats, which is no good for me. Who has the time for that? Repurchase? As a mini, no. Superdrug Pro Vitamin Shine Conditioner with argan oil: Bottle number two of this as for some reason, I opened one before finishing another! I now have two shampoos from this range to finish! It has a lovely smell too it (probably the argan oil) and a little goes a long way. 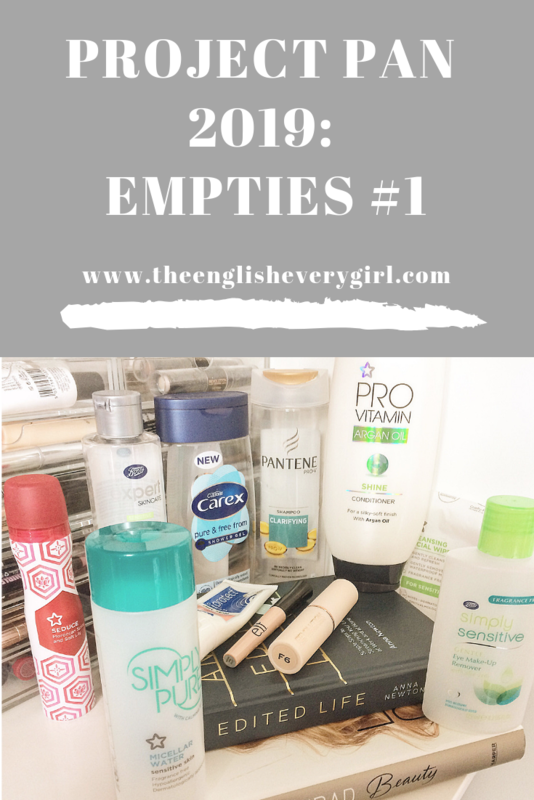 Do you enjoy empties posts? 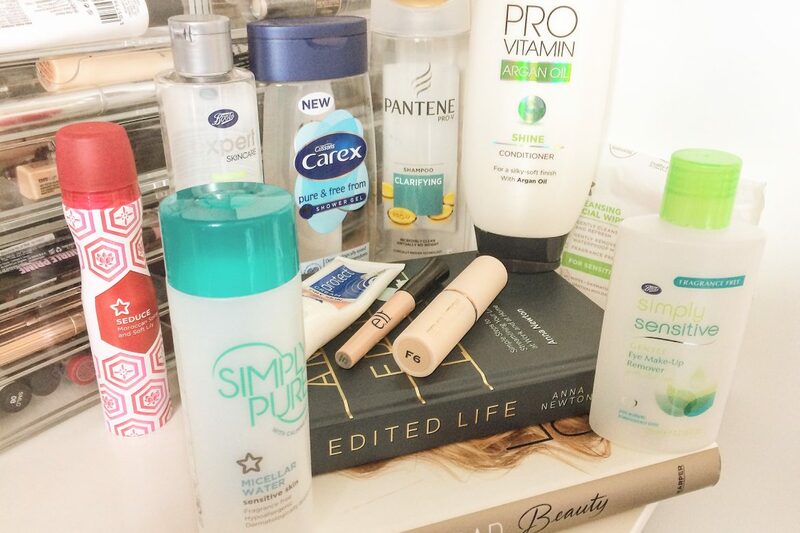 Have you been trying to use up your beauty collection so far this year?